My kids are not allowed cereals with chocolate and honey every day, but they have them at the weekend. 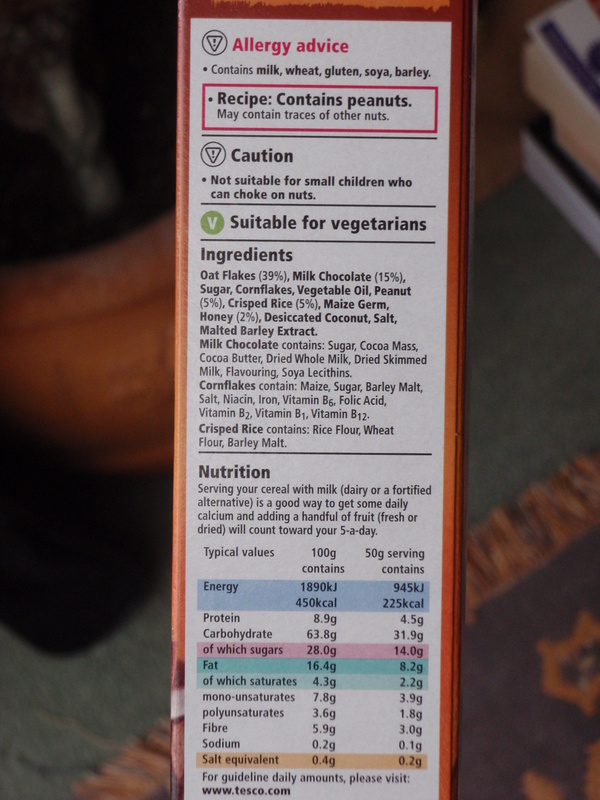 I was looking at this box of Tesco ‘Honey Nut Clusters with Milk Chocolate’ earlier, and I wanted to make sense of the label, to work out what is really inside the box. Here is my analysis, it’s not exactly going to win me a PhD in nutritional science, but I have made sense of it the best I can. The Milk Chocolate has a separate ingredients list: The Milk chocolate is made up almost entirely from cacao and sugar. From my research on the net, I find that the cacao content in milk chocolate is usually low, often just a few percent. The sub-ingredients for this milk chocolate list Cocoa mass and Cocoa butter after sugar, meaning they use cheap processed cocoa (to be expected) to give it that chocolate flavour…hence the added flavourings. By the time you get down to soya lecithins and flavourings, these are less than 1% ingredients. From this sub-listing of ingredients, I would suggest that the milk chocolate component here is at least 70% pure sugar, and I am being conservative…in reality, 90% wouldn’t surprise me. Cornflakes – not specified, I’m guessing at 10%. Sub-ingredients list for the Cornflakes lists contents as mostly maize and sugar. 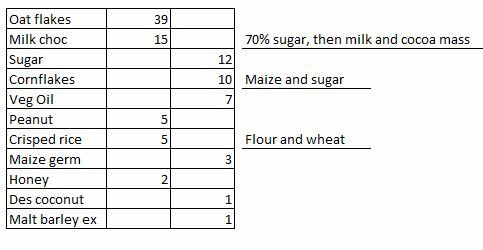 I’m guessing that 20% of the cornflakes, is sugar, meaning sugar contributes here a further 2% of the whole cereal product. So 55% of the contents of this box, is processed grains. As I have written many times before, on its own, this stuff would taste like chewing cardboard, so to make it taste nice and addictive, they have to cover it in sugar. So 26.5% of the contents of this box is refined sugar. So it’s at least 12% processed fat. There is some protein from the milk and peanut, there are vitamins and minerals (added to stop this product from making you ill…without adding synthetic vitamins, the product would have no nutritional value at all) and some salt. 55% plus 26.5% adds up to 81.5%. 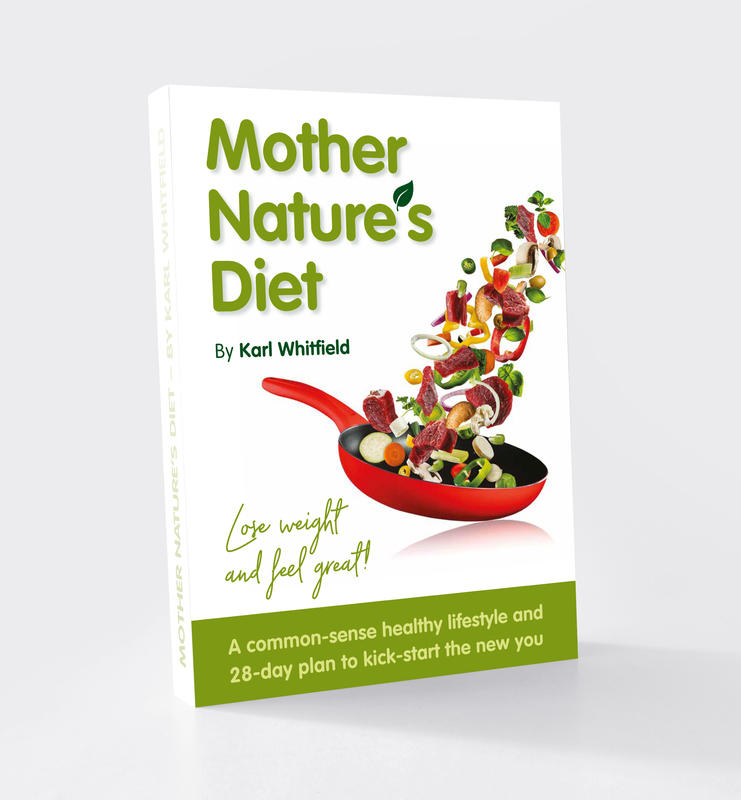 You will often hear me (and many other food and nutrition and healthy eating experts) refer to the big food companies as “the sugar pushers”, or you will hear me talk about how the modern industrialised agricultural system is built around farming grains and sugar, in its many forms. This box of cereal is a classic example. 93% of the contents of this box will not serve your body at all, except to provide ‘empty calories’ of low-grade carbohydrate. Often, looking at the Nutrition panel on a product will not tell you the true story. Learn to understand the ingredients list so you really know what’s in your food – or better still, if it has a label, don’t buy it. Remember, the longer the shelf life…the shorter it will make yours.